Most people figure it out as children: Are you a mayo person or not? My sister Michelle wasn’t. She was straight-up ketchup. But I needed few excuses to slather, dip and otherwise defame any morsel with some mayonnaise. Cans of tuna with lots of it; slather it on the bread, too. Salads, burgers, French fries (how European of me)…you name it, it got mayo. But I’m not sure what makes a mayo person a mayo person. Is everyone else just afraid of living? In fact, I could hold a spoonful of it in front of my sister’s face if I wanted to see her cry. But I only did that once in awhile. And I still love mayonnaise. There are plenty of decadent and delicious vegan varieities on the market these days (and, yes, plenty of not so great ones, too.) But there’s just something so homey about making your own! A connection, I guess. To the land, to your kitchen, to life, and probably mostly to your blender. The thing is, I haven’t had that much success with a convincing homemade vegan mayo. I mean, pureed tofu and stuff can be good but in the end it’s still pureed tofu. I want something thick and fatty and creamy and tangy — something that would make my sister cry. And I think I’ve found it! For the oil, I chose grapeseed because I based it on my favorite storebought vegan mayo: Vegenaise in the purple jar! But I bet olive oil would work, or maybe an olive / canola combo? I am also in love with the Olive Oil Flaxseed Lowfat Vegenaise so in went the flax seeds, and I think that’s what’s making the difference, helping to emulsify and stabilize the ingredients and keep everything on the up and up. This homemade version was so fresh and delicious, it just leveled up everything it touched. My chickpea salad sandwiches became even more precious. My potato salad was a work of art. I used some as the base for a ranch dressing, and dolloped a little (ok a LOT) on a veggie burger. And life was good. And my sister, well, she was three states away and safe…for now! 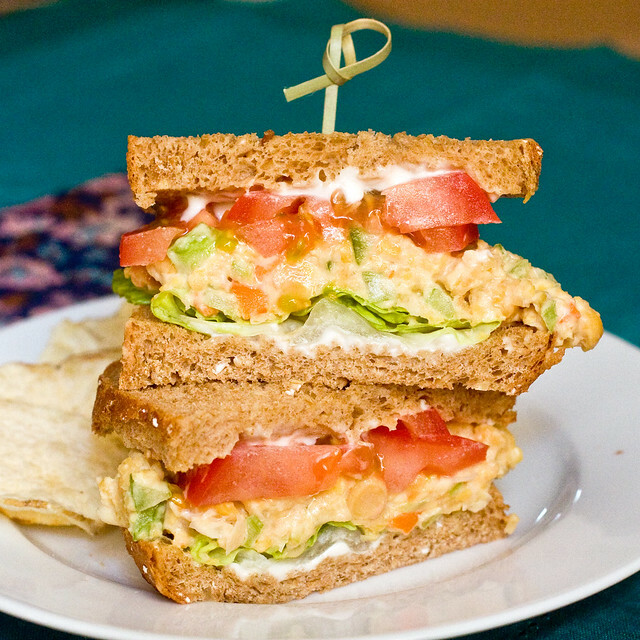 Hope you enjoy, and come back later this week for a few recipes utilizing this mayo, including this simple Chickpea Salad Sammich! ~I think that the kind of milk you use here is way important. Choose the most neutral tasting milk you can find. I would NOT go for hemp or oat milk here. I used unsweetened original flavored Blue Diamond Almond Milk. I know that other almond milks have a pronounced almond taste, so if you can’t find Blue Diamond, then I’d go for an unsweeteend unflavored soymilk. I wish Vitasay still existed in the states! But life is cruel and it doesn’t. ~Depending on the strength of your blender, your times may differ. The important thing is to pay attention to consistency through each step. I use a Breville, which I love and recommend! But no matter your machine, you have to get the flax seeds good and blended, so that the flecks are barely noticeable. That activates its gloopy properties and will also make your mayo prettier. ~ The other important thing to remember is that the oil needs to be added little by little. A lot of mayo recipes say to stream it in slowly but all at once, and I don’t think that is quite necessary. Just add it a tablespoon or two at a time, blend for awhile, then add more. ~The taste of this mayo is very strong at first; the vinegar and salt mellow out over time, so don’t adjust straight from the blender. Let it chill for at least a few hours before deciding on any tweaking you’d like to do for next time. ~Can you use a different vinegar? I’d think so! Distilled white, or apple cider will probably work well. I just prefered the taste of white wine vinegar. I use lemon juice, too, because it adds a brightness to the mix that the vinegar alone lacked. Combine milk and ground flax in a blender. Blend on high speed until flax meal is barely noticeable, and the mixture is frothy, about a minute. Add the sugar, dry mustard, onion powder, salt, vinegar and lemon juice, blending for a few seconds to combine. Now begin to add the oil. With the blender running, use the hole at the top to stream in a tablespoon at a time, blending for about 30 seconds after each addition (if using a high power blender like Vitamix 5 to 10 secs should do it.). Give your blender a break every now and again so that it doesn’t heat up the mayo. You should notice it thickening by the halfway point. By the time you’ve used 3/4 of the oil, it should be spreadable. And with the last addition, you should have a thick mayo. If it seems watery, keep blending. It will probably taste saltier and tangier than you’d like straight out of the blender, but trust me, the flavors mellow and becomes perfect. Transfer to glass tupperware, seal tightly and refrigerate for a few hours, and it will thicken even further. Use within a week. Awesome, thank you! I have to drive over 20 minutes to get decent vegan mayo, so I’ll definitely give this one a go. I make a really quick blender mayo by blitzing up 2 parts rapeseed/canola oil (a cup) to one part unsweetened soy milk. When it is creamy and combined (but v thin) adding in a teaspoon of apple cider vinegar and a pinch of salt and perhaps some mustard powder. Not to take away from your recipe, I am sure it is awesome, but I am v lazy. I first made the blender mayo to accompany a coconut bacon Blt thanks to your blog! I am so gonna try this. We always have original almond milk in the house and never the unsweetened, but I will try with what I have. I have to buy the dry mustard and find a way to grind my flax seeds. I bought some and realized I had no way to grind, so they are in the freezer. This looks fantastic! I will be trying it as soon as I get my hands on some grapeseed oil. TLT with homemade vegemayo? Yes, please! AHHHHH so excited about this! Thank you! I always hated mayo and kind of liked miracle whip, but once I went vegan and discovered vegenaise? Put that shiitake on everything. If you have a small blender then I think so! And it might last longer than a week, I was just playing it safe. This sounds delish! I don’t keep almond milk or soy milk in my pantry. Do you think I could use unwseetened coconut milk instead? Like the packaged coconut beverage kind? I don’t see why not, but then again, I haven’t tried it. So if it doesn’t, don’t get mad at me. Can you replace the sugar with stevia? I personally would just leave it out. Thank you for this! I’m partial to the blue jar Vegenaise (original) which my WF typically runs out of. I don’t care for Vegenaise’s “organic” formula at all (green) and have never tried the purple jar. Cannot stand the consistency or flavor of Nayonnaise – even it’s reformulated product – so I go without if blue Vegenaise is unavailable. Your recipe (and Miss Bear’s – btw, don’t feel bad Miss Bear – foodies like us like to read lots and lots of recipes!) looks easy enough that I’ll give it a try – thanks! Ps I also miss seeing Vitasoy. Wow, that was fast! I think olive oil would make things more beige. Try a pinch of tumeric next time to make it look more eggy? So, I know it’s the same ole story you always hear. I’ve been stalking your blog for years – blah blah blah. Your cookbooks have their own shelf in our (tiny, one-shelf) kitchen – blah blah blah. The day you taught me how to master pie crust is more memorable than the day I met my partner – blah blah blah. But some things demand that the same ole story get repeated. And this mayo recipe is one of those things. Many Thanks. Is there a recipe for the chickpea salad? Looks delish and I’m currently going through a chickpea obsession phase! I’m gonna put it up this week. I had the mayo conversation with a friend a few days ago. I told her I wanted a tomato sandwich with mayo and avocado, and she made a face. She said no to mayo. I laughed, I grew up putting mayo on everything – cauliflower, broccoli, asparagus, artichokes, sandwiches, burgers – everything! It’s inherited 🙂 Thanks for the recipe! I am a Vegenaise girl now too. I am making this ASAP. With olive oil and fresh garlic. And then I’m going to put it on some roasted corn with a squeeze of lime, and then I’m going to die of happiness, because that is straight-up my favorite food. PS, I’m moving abroad soon and won’t be able to rely on finding vegan mayo in the grocery store, so this is such perfect timing! Thank you! Ah! LECITHIN! Of course, that’s it. Thanks so much for making that point. I’m just like “gloopy properties.” Haha. Awesome…I spent so much money on veganase! This is really simple. Oh my gosh, thank you for saving me from another “mayo” recipe that instructs me to add the oil “literally one drop at a time” (which takes, you know, HOURS) only to end up with okay-tasting yet still watery mayonnaise (and a very tired arm). Three cheers for “gloopy properties!! !” You’re a friggin’ genius! Lecithin isn’t for the faint hearted. Got some, spilled a little and had a gooey mess to clean up. Now am afraid to go near it. Glad your recipe doesn’t use it. Also plan to get Bob’s Red Mill golden flax meal – already ground flax seeds – unless you’d advise otherwise – I see it online and imagine WF will carry it. That’s exactly what I use. And yep, my Whole Foods here in Omaha has it. Isa we can’t get onion powder in uk…what else can I use? & btw to UK followers, flaxseed is linseed. Can you get onion flakes or anything like that? Do you think Chia seeds could work in place of the flax? They have creepy cool slimy properties as well but I dunno if that would make a wierd final product or not. I bet it would work! But it would probably show up more than golden flax. See you Tuesday! i’m guessing the flax seed is the “egg?” is there another substitute for the flax? it makes me so nauseous/gag whenever i use it… or can it be omitted all together? Yum! Could one use chia vs flax? Or even omit it altogether? Also, I would have to use coconut milk vs almond! That is one mighty tasty looking sammich. Mmm, mmm. I to am a mayo man. It was Hellman’s on everything. Excited to try this one out. Oooh, lemme know how it goes for you Jeff! I bet you could do wonders with it once you put your HGS spin. I’m DEFINITELY a “mayo person”! : ) This is the first recipe I’ve seen for vegan mayo, though, that I actually want to make; the tofu-based versions have never sounded delicious to me. I do have one question: can I just omit the sugar? I’m surprised to see that ingredient in a recipe for something I don’t think should be sweet at all. You can leave it out! It doesn’t make it sweet, it just heightens the flavors a bit and cuts out any bitterness. Oh my that looks pretty amazing! I love that you can make your own version with grapeseed oil. Where can I get mustard powder??? YES!! one that doesn’t have tofu!! Bless you…bless you a MILLION times!!! As a child I made what I called “special sandwiches” which were made of white bread heaped with miracle whip and and cheese puffs. Mayo for life. Vegan mayo, for life, obv. Haha! Perhaps you can recreate that with Tings. I’m an enabler. Gave this a try yesterday. Love it! @jade t : onion powder is available in pretty much all supermarkets in the UK with the herbs and spices. also ground flax seeds are available from holland and barrett/health food shops. I only cringed a little, well maybe a lot at the memories. But, I’ve come a long way. There is a cafe that has a vegan pblt, portobello, lettuce, tomato, that I love, but I do ask for light mayo. Incidentally, the portobello is sliced small and grilled. Yum! After almond milk you have “see note” but I don’t see a note… and do you think soy or coconut milk would work instead? I make my own almond milk. Do you think it will work for this recipe given that there are no thickeners, stabilizers, etc. in it? Just made this today, it’s great! I only needed half a cup of grapeseed oil before it was thick enough, and it was REALLY thick. I turned my spoon upside down and not a drop moved. I ground the flax seeds myself, could that be the reason? I followed the recipe exactly besides that. Half the oil, not too shabby. Maybe I’m onto something. Oh, and I used soy milk since that’s what I had. I’d like to experiment and find out exactly why it thickened up so well with half the oil. Hands down best vegan mayo I’ve had! I added two dried chipotle chilis (soaked for 20 minutes first), three garlic cloves and a teaspoon of paprika to make chipotle mayo. Delicious! I am so giddy!!! This turned out great (except mine is not a bright white color but more beige???) I was always a miracle whip girl and this has the same tangy flavor =) My first thought was to make some delicious french fries and dip my heart out! I can’t wait to do another version with chipotle powder. Thanks for providing such a simple but delicious recipe. Aaaaaah this takes forever and my blender is stupid. It appears it can’t handle it and I’ve just realised it’s probably not thickening it because it’s heated it 🙁 stupid blender! Well I will let it cool, blend it a bit to try thicken it and then see how it tastes tomorrow :/ it tastes nice at the moment, just tangy as you said. But very thin. I need a better blender! Definitely give your blender a break every now and again. Perhaps I will add that to the tips. We made this yesterday and it turned out very well. Isa, you are a genius. We ground our own flax meal, and used Earth’s Own Almond Fresh almond milk. It took several minutes in the Vitamix to fully incorporate the flax meal. It indeed requires several hours in the refrigerator for the flavours to reach optimal mayo-ness. Hey Isa! I found Vitasoy at my local Asian supermarket! I’m in New Jersey. I found it at a market called Good Fortune on Rte 27. I’d be happy to send you a couple cartons! Yes, you can order it but it’s not widely available like it used to be, sadly. We are having a pasta salad contest at work next week and I am going to use this mayo in the recipe. Awesome! Thanks, Isa. Thank you for this recipe! I have white truffle oil and the mayo is glorious!! I had just been searching for a substitute for the very expensive veganaise….and lo and behold, you have created just the recipe I need. Made it for my omni parents who are considering veganism but haven’t quite found acceptable substitutes for what they love. This recipe alone may have them convinced to make the change! thanks again Isa, for a delicious, spot-on recipe! Vegane Mayonaise | Oh, wie yummi! Hi, I just found your website via your book Vegan with a Vengeance and it’s very exciting to have a place to go for guidance and inspiration in my new plant-based diet! I’m also trying to eat whole foods, which means avoiding oils. Is there a way to substitute a whole food for the oil (avocado or some kind of nut, or a combination)? Many thanks! Hi – my blender is huge and I was concerned about making a small quantity in the blender. Anyway… I used a hand-immersion blender for this mayo recipe and it came out great! Just thought I’d let others know in case you were considering using an immersion blender. I did stream in the oil very slowly and made sure to mix for the full 30 seconds after each batch (as Isa notes in the recipe). help! I,m following the directions exactly, I’m using a vitamix and blue diamond almond milk too, but the mayo is coming out completely thin & runny. Is the motor heating it up and melting it? For those whose ‘naise didn’t thicken, remember the speed of the blender has everything to do with whether you get a good emulsion or not. I have a Vitamix and if I make vegan mayo (which I have many times) on the highest speed it thickens so quickly I can only get in half (or even less) of the oil before it is very thick. So run the blender on high when you are adding the oil. I suppose there may be blenders that just aren’t up to the task. wow – this sounds amazing. I also love Vegenaise, so I’ll be trying this very soon to compare. Thanks for the recipe…and the great notes! I am so excited for this…I get a bit exhausted spending $8 a jar on Vegenaise! Can’t wait to try it! Hey Sebrina ,salba would not give you the speckled look. Thanks Isa, this looks fabulous. For all those complaining about the price of veganaise, spare a thought for us aussies who can’t get it at all and have to beg everybody and anybody to bring us some back when they go to the states :(((. This recipe looks like it might be a good substitute. It’s been 6 months since my last veganaise hit! I don’t find much usefulness in reading 87 comments that basically say “I have to try this!” or “OO!!! This looks tasty! !” I prefer comments that say, “I actually made this in my own kitchen people and it’s awesome.” So, with that little rant (or big rant, whatever), I can say I tried this mayo last weekend and it tastes way better than the stuff in the jar. I followed the recipe exactly except I doubled it. Used it in the chickpea salad sandwich recipe (also freaking amazing) and slathered it on anything else I could find. Thanks for an awesome recipe, Isa! Made this last night and used brown linseed instead of golden, and grated onion in place of the powder – it was mainly juice, it never grates very well!! And I also used palm sugar as I had some in my cupboard and wanted to try it! I was thrilled with the result and I have previously been in the “not a big fan of mayo” camp, but this I am eating by the spoonful!!!!!!! Awesome. Thank you from the north-west of England!! Ahhhh! I just made this yesterday and omigosh delicious! I subbed ACV and an olive/grapeseed/canola blend bc that’s what I had, and skipped the lemon and the onion powder bc I didn’t have any. It turned out great! And I just made the most incredi-bib-ble sandwich! Toasted multi-grain bread, homemade veganaise, organic tomatoes just picked earlier today from the csa, homemade vegan buffalo mozzerella in oil and italian seasonings. Mmmmm. I already had eaten dinner but the husband’s at the movies, the baby is in bed, and I was hungry. It was amazing, the end. On the topic of mayo lovers and haters, I was always a hater. Was completely repulsed by mayonaise, but when I discovered veganaise, I don’t know why, but I loved it. Could eat it with a spoon. And this is no different. Thanks for the recipe, Isa, and congrats on the new cookbook coming out! Can’t wait! I always wonder why a recipe like this should only be good for a week. The oil that went into it is fine for months on end in the fridge. I supposed the almond milk could go bad?? Anyway, I made this on July 28, threw it in the fridge in a jar with a tight fitting lid, and forgot about it until today. Just now I had the most fantabulous chickpea “egg salad” sandwich, and the mayo was absolutely fine. No, better than fine, the mayo made ordinary chickpeas (with chopped carrot, chopped shallot, salt and pepper) taste like freaking ambrosia. My husband sat across the table from me (eating a ham and swiss sandwich) mystified by the orgasmic noises I was making as I chewed……….Does anyone have evidence that this mayo will go bad? How long did it take? I’m not a fan of mayo, because traditional mayo just grosses me out. And all of the store bought vegan mayo I’ve tried is terrible and overpriced. This stuff, however, is magic. SO GOOD! And easy. Genius. I feel like I just did a vegan magic trick. Works perfect! I can’t believe how white and thick it got. I made this and it came out fine. I did have to add more vinegar and salt for our tastes but the flaxseed egg mixture does the trick! thanks so much for cracking the mayo code! Gosh, I’m so glad you didn’t really buy into that McDougall-Forks Over Knives-“don’t eat extracted fats” type crap that is doing nothing but scaring off would-be vegans. Let’s keep our food tasting good! Thanks! Mine almost made it to the mayo stage but not quite. Flavor and color seem fine but texture is still too watery. It should make a great creamy salad dressing! The main problem seems to be heat generated by the blender. Take your time and definitely let your blender rest and cool down, especially if you have a cheaper one like I do. The mixture got very warm before I realized what was happening. Don’t rush it, no matter how much mayonnaise excites you. I was completely anti-mayo (pro-mustard) as a child, but love it as an adult. I made this yesterday, using barely sweetened homemade soy milk (barely sweetened means 2tsp of sugar for 5 liters of soy milk), and soybean oil. For me, the recipe came out too sweet, so next time I will leave the sugar out. Other than that, the flavor and texture is amazing! I was a little worried using soybean oil, but it’s what I had, and fortunately it really didn’t negatively affect the flavor. I didn’t notice the mayo was getting warm til it was very, very warm, like hot to the touch, like you might not be irritable if your soup was that temperature in a restaurant, but for me it came together anyway. I made 2/3 of the recipe in my GIANT blender, and it was no problem. Probably too late now, but Jade T – onion granules are available in the UK in Tesco (in the little glass jars) and most major supermarkets and also in many ethnic food stores. It subs in fine for the powder. This is outstanding. I used all organic ingredients, including cider vinegar for its alkalinity (instead of wine vinegar – acidic), and did not include the mustard due to how it eats the lining of the stomach. I did not use the flax because of a seed allergy and it still whipped up nicely. The unsweetened organic almond milk worked well but my husband has severe almond, soy, rice and dairy allergies, so I will be in think tank mode to come up with a perfect solution. Until I cure what causes those allergies I’ll need to come up with an alternative. Anyways, this is delicious mayo! I LOVE it. Okay, I had a bizarre problem. My mayo was white and thick when I added one last tablespoon of oil, and the mayo instantly separated into a liquid. Just beige clots in yellowish oil. What happened?? Oh yeah, and this was my fourth time making it. The first three were an unqualified success, so I am baffled! I am loving this recipe already. we have a lot of allergies in my house but a nice tuna salad would be nice once in a while. vegan mayo is very expensive. can you suggest some help though. I attempted this recipe with FLAXSEED MILK (soy and nut allergies). it is very thin? what should I do? the flavor is soooooooo good though! I love the flavor! I just read your notes again. I think it was because I did not make a flax-egg in the beginning. it was very thin from the beginning. I will try again. I just made this with sunflower oil, and it tastes amazing straight out of the blender! Thank you for this, I was wondering if I could use sunflower oil instead of grapeseed? Hi Isa- I tried this out the other night, it is SO delicious! I used chia seeds because it’s what I had on hand, and it did affect the color which didn’t bother me at all. It didn’t “firm up” as much as yours, so if anyone wants to use chia seeds I would up the amount maybe just a bit. I’ve been using this to make vegan breakfast sandwiches- English muffin with a spread of the mayonnaise, baked tofu, lettuce, tomato, and bell pepper- YUM! Wow! I JUST made this and I LOVE it even now. Gonna make a little sandwich on the raw zucchini bread I “baked”. Mmmmm, made it just this afternoon. It’s superb! Even with lime instead of lemon, garlicpowder instead of onion (sorry we don’t do dried onion in Amsterdam apparently) and olive oil instead of grape seed oil. Thanks for the recipe, It made my day! It took less oil than the recipe said, but that’s good, I guess 🙂 Hugs! Oh, my goodness! I just made this and a whole new world has opened up to me! It’s delicious and so easy. The best part is, all of these ingredients are items I normally have on hand. No more 2-hour round trips for Vegenaise! Woohoo…thanks so much! Is the onion powder essential? I am not the biggest fan of the way onion powder tastes. Would you suggest any substitutes? Thank you! I finally made this (been meaning to for months). It is sooooooo good. The only things I did differently was sub rice vinegar for the white wine vinegar, Asian hot mustard powder for ground dried mustard (is that the same thing? ), and used an olive/canola/grapeseed oil blend. I didn’t have any onion powder and thought about putting some actual onion or shallot, but didn’t want to take a chance with it having a weird texture. I’m so pumped about having an affordable alternative to store bought vegan mayo! What happens to it after a week? It doesn’t seem to have delicate ingredients that might spoil in the refridgerator. I buy Vegennaise and like it – does it have some kind of preservative ingredient? I’m going to try this but I do hate to waste and don’t want to have to throw it out. Thanks for any advice! Hi Isa. Can i substitute dry mustard with mustard paste?? I made this but I didn’t have flax. I had flax seed oil. I added 1/2 cup and I doubled the recipe. I used garlic powder and apple cider vinegar. Yummy! Just found your site yesterday and this is the first recipe I’ve tried on this website. I made it exactly as you suggested and loved the vinegar added. Thank You so much for this recipe. As I type I am sitting here eating potato salad made with your mayo recipe. This mayo is ABSOLUTELY AMAZING!!! I’m licking the plate. Will be using more recipes from this blog and this mayo is a keeper. Keep up the good work. This kind of recipes makes me so happy to be vegan. This is the first time I’ve ever made mayonnaise, and it came out beautifully. I’ll definitely do this recipe again and again! This recipe should be known worldwide! NB: I’ve made it with Dijon mustard (not powder) and agave (not sugar) and it worked perfectly. Your recipe calls for “flax seeds (sometimes called flax meal).” What? Flaxseed is called flaxseed and flaxseed meal is called flaxseed meal. They are not the same. One is the seed; the other is the seed ground up into a flour consistency. Hope this help. Best mayo, vegan or otherwise! I was a bit spacey and didn’t grind up my flax seeds first, so they went in whole; it still turned out great. I don’t use much mayo on average, so I made just enough to use for a batch of chickpea salad (yet ANOTHER stunningly amazing recipe from your gorgeous cookbook!). I snuck a bit for breakfast and am sooooo looking forward to lunch today: chickpea salad over greens with radish and avocado. Yum! Thanks, Isa! I just made this for the first time and followed recipe exactly. The texture is great but it does not taste like Vegenaise to me. How close to veganaise is this supposed to be (ie were my expectations out of whack?). Can’t really describe what is different. Not tangy enough? I wanted to use it for eggless tofu salad but don’t know if it is quite right for that, as is. I think I will use it instead for a grilled tofu wrap. that sounds yum. I just made this because I didn’t have any silken tofu in the house. WOW! I have not had mayonaise this thick and creamy since post vegan days. I didn’t even use all the oil. The oil content does bother me a little. But since I mainly made this for my kids for blt sandwiches tonight, it’s ok. I will use avocado…if I can restrain myself (tastes so go too!). oops, I mean prevegan! also, I used a vitamix at speed 7. next time I will turn it up slightly yo see if I can get away with using even less oil. Oh my, thank you so much for the recipe! I am eating a spoonful right now, this is so awesome. I didn’t have onion powder or dry mustard, so i used 1/2tsp of mustard instead. I ground my own flaxseeds as well and used 2Tbsps apple cider vinegar. Came together in seconds (used a quality immersion blender)! This tastes a lot like miracle wip. I just wanted to tell you that I made this mayo tonight, and it is AWESOME! The only differences were my almond milk wasn’t unsweetened, so I didn’t add any sugar. I used apple cider vinegar, and canola oil. I used to make mayo with egg all the time before I was vegan. This recipe tastes even better than the egg version!! Even if I wasn’t vegan I’d keep making this one. You were right that the flavor is strong at first, but I can honestly say that I love it, even straight out of the blender! I’m interested to see how the flavors blend tomorrow. Thanks for the awesome recipe! That looks like a good recipe but I cannot make a mayonnaise containing mustard as my son is allergic. He is also allergic to eggs, dairy, nuts and gluten. Veganaise contains canola oil, which comes from the mustard seed. Thus my desire to make a decent mayo at home. Do you have a recipe sans mustard? This turned out great. I used almond milk sweetened slightly with agave and also added a pinch more agave ( this is for my son and I knew this would win him over). I also used apple cider vinegar . I think I could use less mustard next time or a different mustard as it has a wee bit of a hot flavour which my son might taste. I’m hoping it will be ok for him to take to school as it still has nuts ( it makes it so hard) . I can’t wait to try this! This seems like the recipe I’ve been waiting for. Wish me luck! I took the time to read through the comments. I was looking to see if anyone has ever frozen it? At the very end of the comments, there was a question, but not yet an answer, regarding this. If someone did freeze it, what happened? If not, I will have to give it a test. Not knowing how long it will last in the refrigerator, and wanting to keep it on hand for when I need it, I was hoping I could keep some in the freezer. BTW: I heard so many good comments on your cook book, I am going to check it out! I made this, this morning after seeing the chickpea salad sammich recipe which is next up. I am not vegan or even vegetarian and make my own non-vegan mayo regularly via immersion blender. All kind of long story and I hope not offending (the non-vegan part) to say that I made this with an immersion blender in a jar. I saw at least one other commenter used the immersion blender. My method…blend the milk & flax seeds very well, add the rest of the ingredients and let all settle. Blitz briefly with the blender on the bottom of the jar until the mix starts emulsifying. Then raise the blender incorporating all of the oil. – This is same way it’s done with egg and oil. I used my own homemade cashew cream which is flavor neutral and naturally thicker than the almond milk I also make. I used 1/4 cup canola and 1/2 cup grapeseed oil. I use 3/4 cup oil with 1 egg when I make regular mayo so I guessed this would be correct quantiy which it was. It was fairly thick when done but thicker now (2 hours later). I think it is a little sweet and will reduce sugar next round but I love it! On to the sammy! This recipe turned out so well! I never thought to make my own but I will from now on, it was so simple. And I’m a college student with only a magic bullet to blend with. Thanks, Isa. I recently gave up eggs and was despairing at the lack of mayo in my life. This has caused me to no longer despair. I’ve made this a bunch of times before and it’s always worked out. Today I made it with the only difference being that I made it with almond milk(like the recipe says) and not soy like I usually do and it feels thinner than the oil was to begin with! Any ideas what gives? I made this today and it is absolutely fab. I had to use red wine vinegar (all I had in the fridge) and I used a mixture of sunflower and olive oil. I did use ground flax but, like the last poster, I still had speckles in my mayo. But it didn’t deter from the taste. Better than any of the shop mayo (and in the UK we only have a few), and with less ingredients. To anyone wondering if coconut milk (the beverage variety in the carton) will work instead of almond milk, it will! I’ve made this a bunch of times with almond milk and it’s always delicious. This time I didn’t have any and all I had was coconut milk — the sweetened kind, unfortunately. But luckily for me it actually still needed a tsp of sugar and it was golden! Probably the most essential vegan recipe so far in my steadily growing repertoire. Second time making (see comment 4 steps above) and even better this time round. Bought the ‘golden’ (very important for pale colour) ‘ground’ (very important for even colour without speckles) flax seeds this time but found that the mayo didn’t thicken up quite so well (previously it had actually thickened up a little too much too quickly). I think this is due to me measuring the flax seeds before I ground them & therefore using far more by volume. To remedy this problem (rather timidly) I added another 1/2 tablespoon of ground flax seeds after all of the oil was already incorporated into the mayo and continued blending. Et voila! Mayo thickened up perfectly within seconds. Next time I will add another 1/2 tablespoon right from the start but this may not work for you, I guess everyone’s blender works slightly differently. Big up to Isa once more, just bought her new book ‘Isa Does It’ and could not recommend it enough. 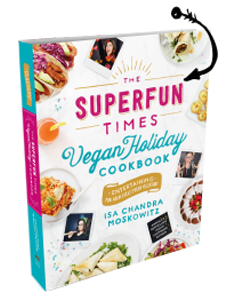 Beautiful recipes with lovely fun descriptions and unlike Veganomicon lots and lots of lovely enticing pictures! i just love how the universe works! just this morning i was wishing for a recipe for egg free mayo they i could make with stevia. i love veganaise, but it has rice syrup that i would like to avoid for awhile…so i will be making this today. thanks! Tried it with run-of-the-mill plain soymilk and it still came out really well (even if a tad too sweet for my liking). Like others, mine came out flecked, but it’s no big deal. I’m SO looking forward to trying it with different oils and customizing it! Will never go back to the store bought kind. Mayonnaise | Post Punk Kitchen | Vegan Baking & Vegan Cooking. at otther online sites, I would like to follow everything fresh you have to post. Oh My GoD! This stuff is amazing!!! No it does not taste like grapeseed vegenaise – it’s better! I even made the garbanzo sandwich immediately after and yes I slathered more ‘vegenaise’ on each bite! I am not a mayo eater, I tried vegenaise on a whim and was hooked, now I have two excellent things to slather on sandwiches, omelets, baked potatoes, uh basically everything savory. PPK you are now on my radar YES! Made this with unsweetened soy milk and it seemed to thicken up FAST. I only ended up using 3/4 c oil, and even added some filtered water to thin it out a bit. Figured the water was okay since it’s on my vegenaise label. 🙂 Also, used a canola & coconut oil blend I found on sale, added only 1.5 teaspoons sugar and was out of onion powder, so omitted. Great recipe! I’ve just made a batch of this and it is mellowing in the fridge. I had to use a sunflower/olive oil mix as I’ve never seen grape seed oil in Portugal. I seem to have had the opposite problem to many people as it got too thick for me (ended up a bit gelatinous) – maybe my ground linseeds are gloopier? I’ll try adding a bit less next time. Looking at the other comments, it looks like I probably could have stopped adding oil once it was thick enough, although I would think that would affect the flavour quite a bit. Never mind, this stuff will be great for spreading if not dipping and I’ll fiddle a bit with the next attempt. Great to have mayonnaise back in the fridge again! Vegan Fast Week 1 | Ponyboy's Two Cents!! I tried this recipe. It is great. I made my own almond milk by putting 1/2 cup of almonds to 1 1/2 cup of water in the blender. Blend for about a minute and strain through a milk bag. I also mixed all the other ingredients, except the flax meal and oil, in the blender for thirty seconds so the seasoning with give it a richer taste. I then added the flax meal and last the oil as the recipe called for. If you like it more like Miracle Whip, I used only 2 tsp. of the apple cider vinegar and added another teaspoon of honey. To make a dressing, you take a tsp. of onion powder. 1/2 tsp. sea salt, and 1/4 tsp. of herbamaire and add 1/4 c. water, mix well then adding the vegan mayo. It can be used as an onion dip, placed on bake potatoes, used on cole slaw. I have tried this recipe with many things and everyone has loved it. 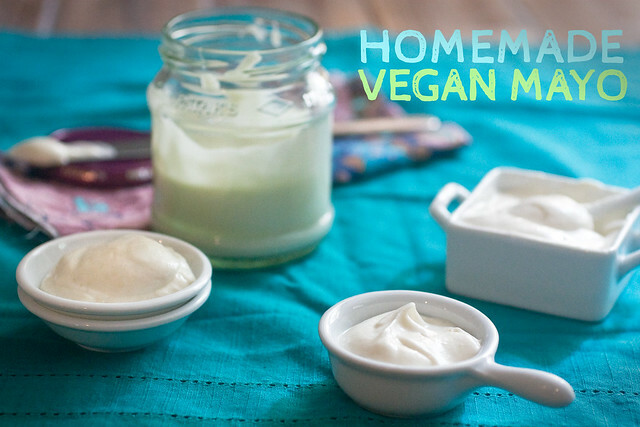 The vegan mayo is a very easy recipe to make. I would LOVE to know what is in that chick pea sandwich, it looks amazing! Thank you so much for this recipe. I have tried dozens of vegan mayo recipes and this is by far the best I have tried. It has a fantastic creamy consistency and very thick and stable. I used soy milk and canola oil because that is all I had on hand. As you said, the taste mellows perfectly after a few hours. I’m going to use it to make a chickpea of the sea sandwich later. Can’t wait! I have a long list of things to try this with. Mine didn’t work 🙁 And I was so excited. I don’t know if it’s because my blender gets too hot or what. The only substitution I used was unsweetened cashew milk instead of almond as I’m allergic to almond… I don’t see that being the issue though. I even eventually started putting the blender in the freezer for 15 or so mins in between every couple of oil tablespoons and that barely helped keep it cool – two minutes blending and it was hot again. I still have a slight bit of oil to go, as I’m once again letting it cool, but I don’t see it shaping up with what little oil I have left. Not to mention how agonizing it is to have to wait forever for it to re-cool after such a short time blending! I recently made this recipe and it turned out so well, so much better than I could have anticipated! In an effort to save money on grapeseed oil, I used half canola, half olive oil, and substituted dijon mustard for mustard powder. I added a few tablespoons of oil every 15 seconds, and it turned out just fine. As Isa indicated, the flavor is quite overpowering initially but after having the mayonnaise set overnight it turned out great. Highly recommended! Is there another nut milk that could be used in place of almond milk? My husband has an allergy to soy and almonds. I really want to start making a veganaise, as it is expensive to buy on a regular basis. Thank you Isa for all your awesome recipes! Isa, thank you for this recipe! Vegenaise is expensive, and Whole Foods is far from where I live, so now I don’t have to depend on it! I have Nutribullet, and had to start and stop it to add the oil, but it wasn’t bad. The end result is what matters, and by about day two the mayo mellowed out very, very nicely, it tasted almost like Vegenaise. I just love this recipe, but it comes out way too thick. I don’t like using vinegar so I used all lemon juice. does that make a difference? I also make my own almond milk with 1 cup blanched almonds and 4 cups water and a 1/2 teaspoon of Himalayan salt. I don’t strain the milk it has more fiber that way. I have a vita mix and I honestly don’t see any difference. I am very concerned about health and make as much as possible from scratch. I love this recipe but I did make a few changes sort of. I use 1/8 cup blanched almonds and 1/2 cup water in place of the milk and I grind my own flax seed and mustard seed and I use only 3/4 cup of grapeseed oil because the with the changes it makes it way too thick to spread. People from my church loves it too. God bless you and havew a nice evening. I can’t wait to try this!!! 1) because mayo is freakin’ awesome, and 2) because Isa is freakin’ awesome. So mayo made by Isa…. going down this week. Gonna get my spicy fries ready for dipping! I made this today – needed mayo and we were out. Substituted based on what we had on hand. Used Blue Diamond standard almond milk, so skipped adding the sugar. No lemons so used 2T vinegar, used 1t stone ground mustard instead of the powder, and made with Canola oil. The texture is good, and it tastes a bit like tarter sauce (probably because we didn’t have lemon). My only problem was that the flax seed did not “disappear” – still was very apparent in the final product although I have a BlendTec and blended for 2 minutes prior to adding the oil. Any suggestions? 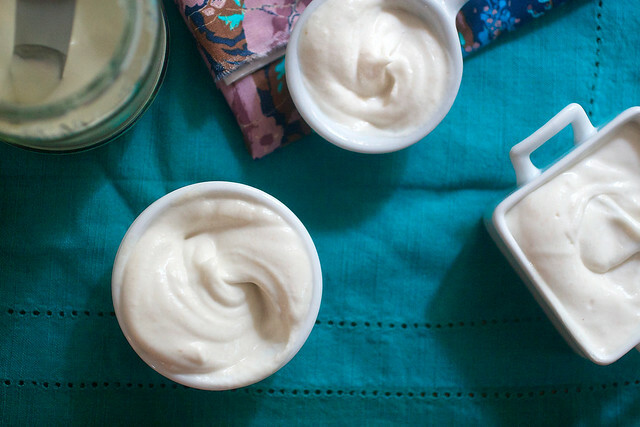 Have you ever tried making mayo with aquafaba? (liquid from cooking chick peas, or liquid in canned chickpeas. Apparently this stuff is a good egg/egg white substitute) I haven’t tried it yet, but I’ll try yours first IF we have any almond milk left..
One of the Best vegannaise i have ever taste!